This kit replaces the factory spur gear drive train with timing belts. The pulley modification reduces the spur gear errors that are typical and therefore reduces tracking errors. The belts also make slewing much quieter eliminating the 'grinding' noise that the standard spur gears produce. The pulley ratio is the same as the factory gears. This means the Synscan hand controller is unaffected by this upgrade. All Synscan functions will operate as before. An optional bearing removal tool is available separately and is recommended to purchase along with the kit. Please click here to see this on our website. 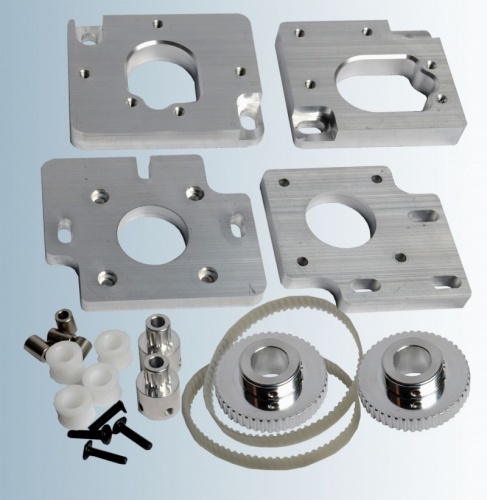 The kit uses a 6mm wide belt and does not require the slot in the mount casting to be modified as required by some kits. The pulleys are design and produced specifically for the NEQ6 mount and manufactured to a high precision. We don't take stock parts and modify them to fit.